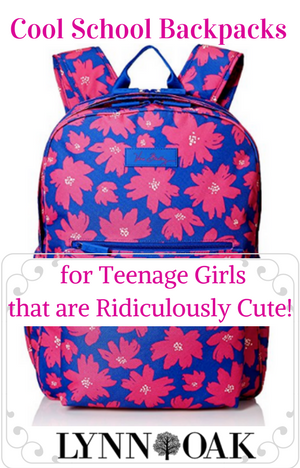 Cool School Backpacks for Teenage Girls That Are Ridiculously Cute! It's that time of year again! Is it me or did the summer just fly by?! I found some Cool School Backpacks for Teenage Girls that are Ridiculously Cute! You will be the cat's meow if you head back to school with one of these babies strapped to your back. I'm a big fan of hers and I love the nice new patterns that have come out this year. I can't wait to get my Fall Preview catalog in the mail and she didn't fail me this year. I just love all the new colors too. Have a look with me as I show you what I found on my favorite online store. You can usually get a great deal on older patterns, just keep checking until you find one that you like that is on sale. I love the color of this one, the blue and red poppies just make it pop! Plenty of room for your books as its 12" by 16" wide. I love the patchwork pink colors of this one. Standard size of 12" x 16". Room for your phone and books, with the zipper compartment in the front. This is one of my favorite light colored. I also like the bigger size pockets on the sides. This one is a little bit bigger but lots of compartments. Everyone just raves about it and you can pick different patterns in this same design. Which is awesome! This is the same design as the one above only this is a favorite to buy. It's black with rose pattern which I noticed a lot of people bought and said they would buy another one in a different pattern, they loved the style so much. This one is a little bit smaller and by far my favorite one of all of them. Saved the best for last on this one. I LOVE the colors! So bright and cheery, reminds me of a tropical beach. You can't go wrong when you buy this brand. I've been buying them for years. They last so much that you can sell your old one on eBay and have enough money to buy a new one. They are that Awesome! ← 5 Best Camping Chairs Ever!